What is the Difference Between a Bunion and a Tailor's Bunion? A tailor’s bunion, also known as a bunionette, is a bump on the outside of the foot under the pinky toe (see diagram below). Tailor’s bunion got it’s name when tailor’s use to sit cross-legged and the outside bones of the feet would rub against the floor. Most people think bunionettes are caused to tight shoes. Even thought wearing the wrong size shoe might cause pain, it usually is not the cause. What happens is that there is a mechanical disturbance of the feet. During walking, the bones of the feet are not in perfect alignment and more weight is being distributed to that part of the foot. This causes the tendons and ligaments of the foot to change position. Due to this alteration, the bone moves outward and then the bunionette begins to develop. 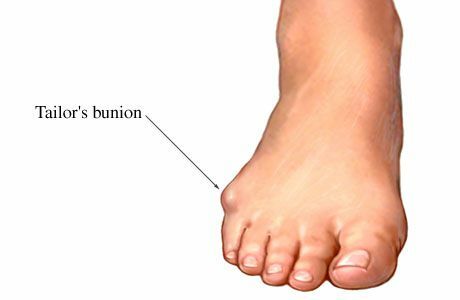 What are the Symptoms of a Bunionette? Most people will feel a sharp or aching type of pain. This is because the bump will press on a nerve. Pain usually occurs when walking in a closed shoe because the nerve is now sandwiched between the shoe and the bone. You might wonder how you got this bunionette. Bunionettes are not normally caused by tight shoes, they just irritate them. Most foot problems are due to poor foot mechanics. The foot is not functioning properly during gait. Thus, the bones get out of alignment and all of this is due to poor genetics. There are all grades of bunionettes, simple, moderate or complex. Most simple bunionettes just might need some temporary padding and an injection of cortisone to stop the irritation. To prevent it from getting worse, you might need to change the type of shoes you are wearing or change the size. About 80 percent of the population is wearing the wrong size shoe. If the shoe fits the front of the foot, but your heel tends to slip out, then you can get a tongue pad from the shoe store. This will force your heel back. I wear a size B width shoe, so all my loafers have these pads. Besides padding, injections or changing your shoes, you might need a custom orthotic, which is an insert that is made especially for you to keep the foot aligned and prevent the bunionette from worsening. In more severe cases, where the bunionette is bigger, surgery will most likely be necessary. This is a same day procedure and you can go home walking with a walking boot. Crutches or a cast is rarely necessary. If your job is most of a sitting one, then you might just miss a day or two. You will be back into your regular walking shoes in approximately four weeks. Most patients state they have minimal pain. The key is to ice the area as much as possible during the first three days after the procedure.